Coleus downy mildew causes both spotting and leaf twisting. 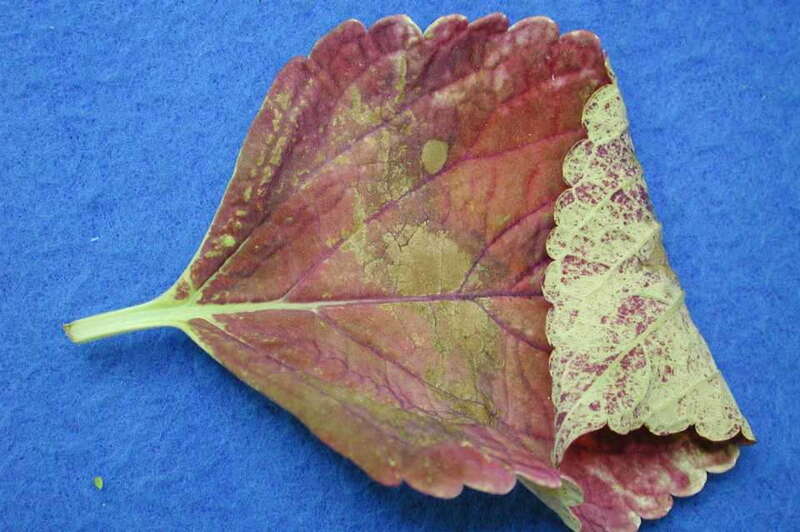 A new disease only 10 years ago, coleus downy mildew was seen for the first time in Louisiana and New York in 2005. Growers later mentioned seeing it in Florida in the same year. The disease spread through the industry over the next few years, causing crop losses in both cutting-grown and seed-grown coleus. Plants infected while being rooted under mist were the most dramatically stricken. Infected leaves would develop spots or flecks, twist and drop to the pot surface. At times, the undersurfaces of leaves would be covered with a downy coating of grayish sporulation. The greatest losses from downy mildew were seen from 2005 to 2007, when growers weren’t aware of what the problem was or how to minimize it. More recently, because of the relatively huge furor over downy mildew on impatiens, the industry has lowered its alarm level for coleus downy mildew. But this disease is more important than ever now, since those wishing to grow colorful plants in shade may be turning to coleus in lieu of impatiens. Downy mildew can rob coleus of its expected stellar garden performance, so mastering this disease is important for keeping coleus as an important impatiens alternative. The coleus and impatiens diseases are not caused by the same microorganism: coleus is attacked by a Peronospora sp., while impatiens downy mildew is a Plasmopara sp. The coleus disease is closely related to the downy mildew on basil, but those two diseases are also distinct — infections are not passing between coleus and basil under natural conditions. Studies on coleus downy mildew at Michigan State University (MSU) and Cornell University have shown that coleus downy mildew is not quite as intractable an adversary as impatiens downy mildew. With impatiens downy mildew, plants develop systemic infection and die. All Impatiens walleriana cultivars and hybrids seem vulnerable to the impatiens downy mildew. With coleus downy mildew, infection causes spotting most often and leaf drop in the worst cases, but not total plant collapse. Also, the many cultivars of coleus (Solenostemon scutellarioides) respond very differently to infection. Some will show no symptoms, while others show extensive symptoms, including leaf drop. Plant breeders will henceforth be choosing coleus on the basis of their downy mildew tolerance, as well as for their form and coloration. Hopefully, the most vulnerable coleus lines will be discarded in favor of those that are naturally less prone to the disease. Studies on 147 cultivars of coleus at MSU and Cornell over the past decade allowed comparison of the symptoms that developed when these were exposed to downy mildew under controlled conditions. The complexity of data collection made it impossible to compare these all at the same time, but conditions were similar in each of the experiments and always favorable to disease development. Table 1 lists the plants that got the highest ratings for health when exposed to natural or applied inoculum of downy mildew. To see the complete ranking, including the names of cultivars that were very prone to downy mildew, check out AFE Special Research Report #136. Studies at MSU have established the basics of the epidemiology of coleus downy mildew. A Burkard spore trap was used to continuously monitor the production of downy mildew sporangia in the greenhouse over time, so that the population of sporangia in the air could be related to time of day, temperature and humidity. This technique allowed us to find out that sporangia are released in the greenhouse when a period of high humidity (above 95 percent) is followed by a drop in humidity — the peak release is usually midday (Figure 1). Coleus cultivars ‘Volcano’ and ‘Black Dragon’ were used to study temperature effects in growth chambers. Experimental data showed that cooler temperatures (59°F or 68°F) promoted infection and sporulation, while little disease or sporulation developed at 77°F and no infection or sporulation occurred at 85°F. Because of coleus downy mildew’s environmental requirements, healthy-appearing cuttings or plants might at times have latent infections that could cause widespread problems later, when the environment is more favorable for the disease. Cool, rainy periods during the summer have led to disease outbreaks in garden plantings of coleus. Avoiding excessive relative humidity during greenhouse production can reduce the opportunity for downy mildew to develop and spread. Growers whose crops have been troubled with downy mildew in the past may find it helpful to delay coleus production until later in the spring, when the weather is warmer. More details on the epidemiology of this disease from MSU research may be found in AFE Special Research Report #134. In addition to disease management through cultivar choice and environmental manipulation, fungicide applications can also help keep coleus free from downy mildew. The most effective active ingredients in research trials conducted in New York and Michigan over the years have been mefenoxam (Subdue MAXX as a drench at 1 fl oz/100 gal), dimethomorph (Stature at the high labeled rate of 12.8 oz/100 gal), fenamidone (FenStop at 14 fl oz/100 gal), ametoctradin + dimethomorph (Orvego at 14 fl oz/100 gal), boscalid + pyraclostrobin (Pageant at 18 oz/100 gal), azoxystrobin (Heritage at 4 oz/100 gal) and fluopicolide (Adorn 4SC at 2 fl oz/100 gal), as well as mancozeb (Dithane at 1 lb/100 gal). Used preventively, these materials have effectively suppressed or eliminated symptoms and sporulation of the downy mildew. Product labels must be followed carefully regarding tank mix requirements and rules related to rotation strategy. Downy mildews are very much inclined to develop resistance to single-site mode of action materials. Well-planned rotations will preserve the usefulness of the effective compounds. 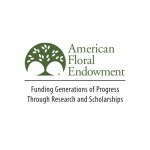 This research was based upon work supported by Specific Cooperative Agreement 58-1907-0-096 with USDA-ARS under the Floriculture and Nursery Research Initiative and by the American Floral Endowment. Blair Harlan works as a research assistant for the Plant, Soil and Microbial Sciences department at Michigan State University. See all author stories here. Sheila Linderman works as a research assistant for the Plant, Soil and Microbial Sciences department at Michigan State University. See all author stories here. Lynn Hyatt is a research support specialist in Plant Pathology and Plant-Microbe Biology at Cornell University. See all author stories here. Mary Hausbeck is a professor and Extension specialist for the Plant, Soil and Microbial Sciences department at Michigan State University. See all author stories here. The leader in profits, production, and education for greenhouse growers.